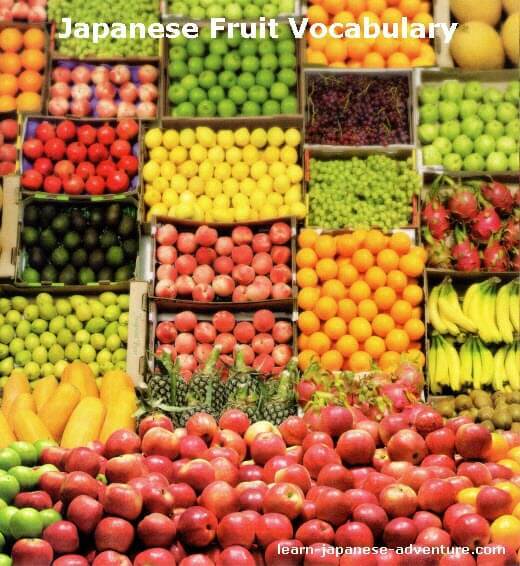 This section covers the list of Japanese fruit words and vocabulary. As many fruits are imported from foreign countries, most are written in katakana. You will find that fruits in Japan are rather expensive. This is because many fruits are imported, especially fruits that are common in tropical regions like バナナ (banana), パパイヤ (papaya), マンゴー (mango), etc. The most popular Japanese fruit that produced in Japan is perhaps the Fuji Apple. Most of the Fuji Apples are grown in 青森県 (aomori ken - Aomori Prefecture), which produces more than 50% of the apples in Japan. The Fuji Apples are not only popular in Japan but is also gaining popularity around the world. Perhaps you might have noticed in the news that some clever Japanese farmers found a method to grow watermelons which are square in shape. And they can be sold higher in price than the normal ones. Let's check out the list of words for Japanese fruits. These are some common Japanese fruit words that I have collected so far. More words on Japanese fruits will be added in future.